This stamp from Latvia seemed to fit the stylish clothing theme, but it wasn't immediately clear what. I thought sashes, at first. Actually it's MITTENS! 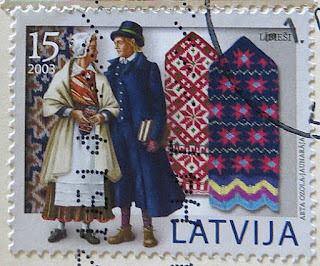 Part of a series that was issued from 2002 - 2005 (and I now desperately wish I had the whole set) and each stamp shows costumes and particular mitten designs of different ethnic regions in Latvia - here Lībieši. Each pair features a unique design, utilizing a wide variety of traditional colors, patterns and symbols. For Latvians, mittens are much more than a way to warm your hands. Every ethnographic Latvian mitten tells a story, marks an anniversary and represents a specific region in Latvia. Some mitten designs are specially intended for weddings or other special events. There is even a rich tradition of folkloric etiquette associated with the wearing, storing and displaying of mittens. I did not know that Latvia was famous for the fact that archaeologists had found the oldest mittens - dated from about 1,000 years ago. Although the mittens were made for warmth, they also played a decorative role. By fastening them behind the waistband, they were worn in summer as a bijouterie and adornment. For several centuries they were the main form of gift and endowed with magical significance. These mittens are shaped like a gauntlet and not fitted at the wrist. This is partly a fashion preference, but also to accommodate the complete pattern repetition. They are made using several double pointed needles in a dense gauge. I am not a knitter, but from my research I gather these are not particularly easy to make. For starters, the patterns often only include a fragment of the design - and you repeat until you get to the top and gradually taper to a point. For another, the design is continuous and encircles the hand, including the thumb, which appears indistinguishable from the main body of the mitten. For the 2006 NATO Summit held in Latvia, hundreds of men and women, aged from 30 - 86, knitted 4,500 pairs of mittens - each one different - as souvenirs for the delegates and media representatives and perhaps helped create a surge of interest in this craft. I usually just buy ones that match or complement my coat, but these really stand out. I wonder what those NATO people did with theirs? It wasn't actually my first choice, but once I looked into it, well, why not? No less stylish than hats. I hadn't given mittens much thought. A thousand years ago was a long time ago! Mittens are a bit out of season, aren't they? I'm wondering how those 1000 yr old mitts looked when they were dug up. Gorgeous, I'd be tempted to buy some of these. Such a simple object with so much cultural history. I was just thinking boy that country must be cold until the explanation about summer use.